Leave the stresses of everyday life behind and enjoy a relaxing vacation along the beautiful Maine coast, where the slogan 'The way life should be' holds true. This hidden treasure located at the end of a peninsula, offers views of scenic harbors and spectacular sunsets. Wake to the sound of passing lobster boats, sip beverages on the deck overlooking the shore, and enjoy the fresh, cool summer breezes. This 625 square foot guest cottage is located on the lower level of a family home. It is totally self-contained and has private entrances. The original structure was an addition to this charming 1927 summer home about 50 years ago and recently has been refurbished to include all the modern conveniences. This cozy get away is economically priced and affords all the luxuries of a private rental. Comfortably sleeping 2 adults, a second all-purpose room contains a convertible couch for children or overnight guests, a full kitchen and dining section, and a living area with spectacular views. Whether you are interested in dabbling in Maine's history, visiting lighthouses, taking excursions, or just enjoying the shore and eating lobster, this is the place for you. So sit back, relax, and remember days gone by, when life was simpler and vacations were a time for relaxation and renewal. As a child this beautiful Maine home was owned by my grandparents. Grandpa built a separate unit, which is now what we refer to as our bungalow, so that all of his grandchildren and their families could enjoy the vacation home and he and Grandma could still keep their sanity! Growing up in this house made it a part of me, the sights and smells of the ocean, and the memories attached to them. So, in 2008, when the second generation needed to sell it, my husband and I bought it in order to maintain the family traditions. The grandchildren are all grown now, some with grandchildren of their own but the traditions will carry on. We hope you can make some memories too, and enjoy this beautiful spot just as we do. You can have as much privacy as you want or you can visit with the others who are living in the main house or renting the other guest cottage. For anyone looking for a little adventure....We really enjoyed the location. The beach was great to explore and pick up interesting rocks. The weather was too cold and windy in mid-Oct. to enjoy the deck area. Property was needing a good cleaning at end of season but we overlooked it because Margaret was very sweet and welcoming. The fall colors were beautiful and we loved watching the lobster boats come and go. Would like to return in the summer. The apartment was clean, comfortable and right on the water. It's very quiet, perfect for reading and having down time. Kayaking is fantastic with good access to water. Brought bikes and had some nice rides, but roads are very narrow with moderate traffic. We are returning next year! 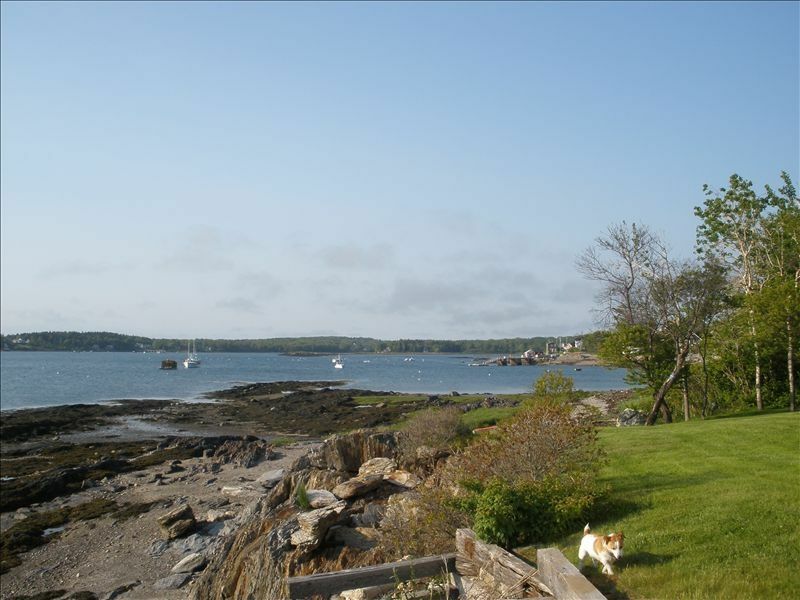 This was our second summer stay in Harpswell, and we already have reserved a spot for next year! We enjoy the total tranquility and come home feeling rested and happy. Our dog Boo really enjoys his walks on the beach, and listening to the birds and the waves. The views are wonderful after the fog lifts ( which it does most days). A few more kitchen items would be great, like a baking dish or 2, metal spatula for the grill, and a paring knife.. Overall, we love the no frills cabin feel and easy living, and can’t wait to come back! Love Margaret’s very warm welcome and goodbyes!!! Thanks you all! 4+ stars! The location of the property is amazing! It is waterfront with easy access down onto the shore. My siblings and I spent a wonderful 3 days. We spent hours beach combing but also enjoyed just sitting and enjoying the view of Pott’s Harbor. The inside of the property is dated but the bed and futon were comfortable. Margaret lives on the property and is a welcoming, friendly host. Elizabeth, her daughter, handles the reservations and answered all my questions promptly. There has been a lot of thought and time put into details of what to expect at the property as well as the general area. Absolutely perfect getaway for family and pets! Great views and very relaxing!